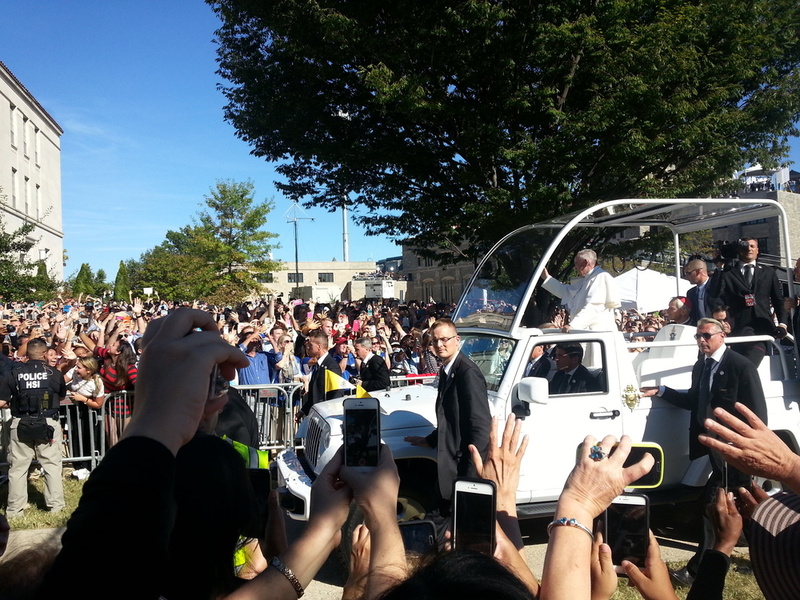 Last month I had the extreme honor of getting to see Pope Francis during his visit to DC. 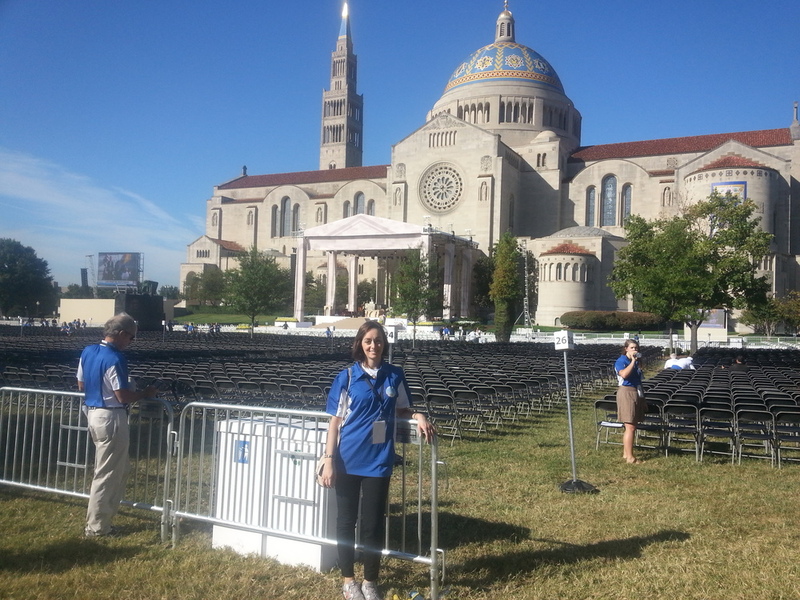 I arrived at 6:30 in the morning and didn't leave until 12 hours later, volunteering all day with CUA and the John Carroll Society, helping to seat the thousands of people that arrived. I saw some old friends, made some new, and most importantly, witnessed this incredible moment in the history of the nation, the Church and the world. Pope Francis is as real as you'd imagine. As his caravan passed (complete with Popemobile and stern looking Secret Service dudes), he smiled and waved and I felt such a sense of genuine love and care. He is what you'd expect - small, bright, fearless. It was also extra special that the Mass wasn't just a regular Mass, but a canonization for (now Saint) Juniperro Serra. Not only that, but it is the first canonization to ever take place on American soil. And I was there - and I saw it! Most of all, though, what I will remember is the faith of all those around me. The day could have felt like a celebrity sighting, but it didn't. 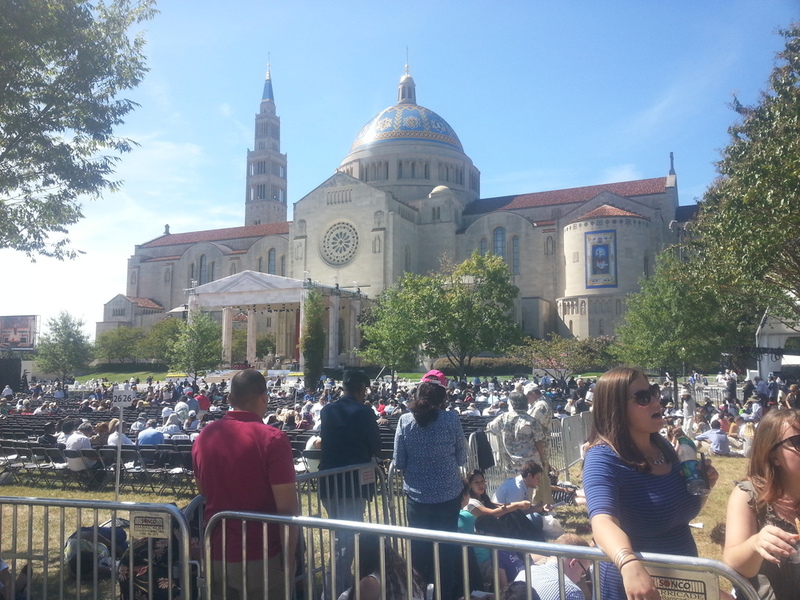 Everyone was happy, smiling, enjoying the incredible weather, waiting with joy for the Holy Father. And then to be in the middle of the crowd as the songs were sung and the prayers were prayed, all together, in many languages - it was otherworldly. For a moment, it was true peace. I have done my best to upload photos, without knowing if I have done it correctly. If not, I will go back and fix it at some point. But I wanted to share just a bit of what it was like there that very special day.